From the Bureau of Environmental Services, some aerial photos of the Oaks Bottom restoration work that has closed the Springwater Corridor until Oct. 31. The photos are at the bottom of the slide show. It’s a pretty big dig. 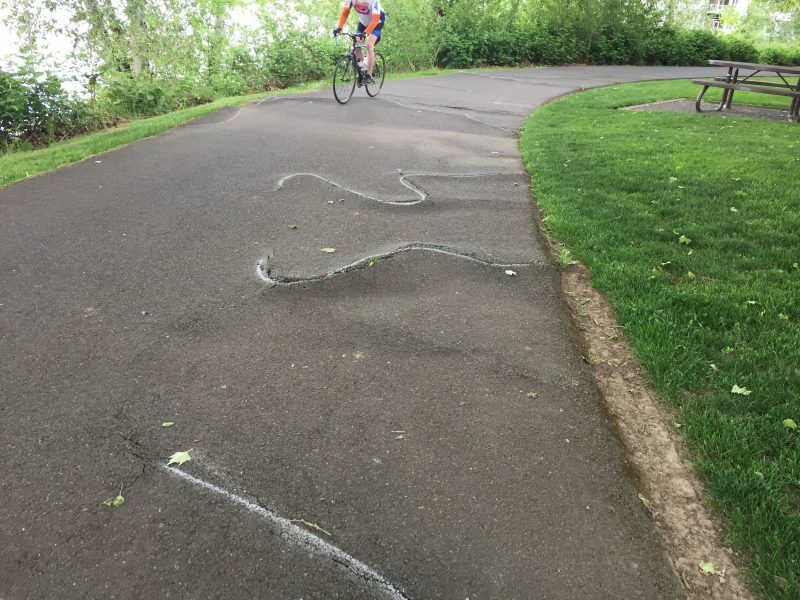 Parks & Rec says it found a contractor to repair a bumpy section of the Willamette Greenway Trail, starting June 5, ending June 8. That section of the trail, south of Rosswood Restaurant, near Cottonwood Bay, will be closed during repairs. This is good news, coming a month before they close the Springwater Corridor for four months, starting July 1. Portland Parks & Recreation (PP&R) announces that a section of southwest Portland’s Willamette Greenway Trail will be closed next week to allow for construction improvements. The closed portion of the trail will be in the area of Cottonwood Bay (extending north and south of SW Hamilton Court). The improvement work and trail closure will begin Tuesday, June 5, and last no later than Friday, June 8, 2018; though PP&R and the contractor are hopeful work can be completed by the end of the day on Thursday, June 7. Work is scheduled to begin starting at 8am and to end no later than 7pm on each of the days. Commuters, bicyclists, walkers and runners should be aware they cannot proceed through the work area. Alternative routes include using the Sellwood Bridge to travel across the river to the Springwater Corridor Trail. Routes back to the west side include the Tilikum Crossing and Hawthorne Bridges. PP&R staff will ensure that notification signs are in place beginning on Monday, June 4, 2018. Expected completion date: no later than Friday, June 8, 2018, and hopefully the end of the day on Thursday, June 7. Work location: The closed portion of the trail will be in the area of Cottonwood Bay (extending north and south of SW Hamilton Court). Impacts: Commuters, bicyclists, walkers and runners should be aware they cannot proceed through the work area. 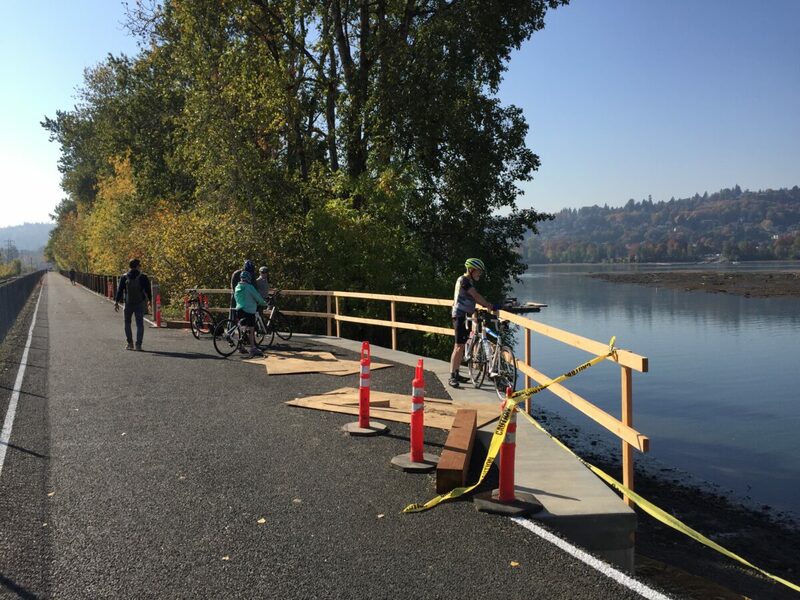 Alternative routes include using the Sellwood Bridge to travel across the river to the Springwater Corridor Trail. Routes back to the west side include the Tilikum Crossing and Hawthorne Bridges. PP&R will install informative signs, as well as any necessary barricades, cones, caution tape, etc. Can we do anything about the pavement breaks and bumps on the westside Willamette Greenway Trail? The bad section is south of Rosswood Restaurant — looks like Floragenex, Inc. and OTRADI Bioscience Incubator are businesses that look out on that section of the trail. Am I right that the maintenance of that part is the responsibility of the businesses? With the closing of the Springwater from July to October, more of us will ride the west side and it’s dangerous. A mudslide is blocking the Springwater Corridor just south of the Ross Island Bridge, Wednesday morning. Of course, no one had plowed the corridor.